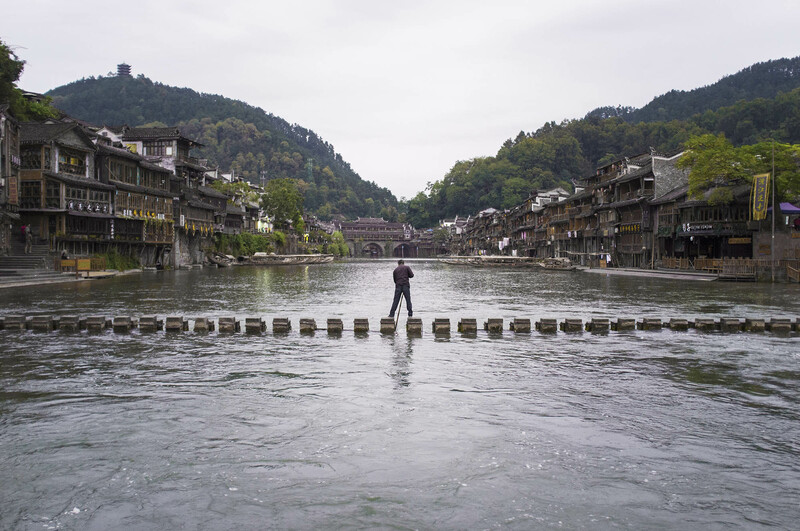 China is huge, and so where possible it is better to travel by plane or by fast train, unfortunately neither of these modes of transport go to Fenghuang. 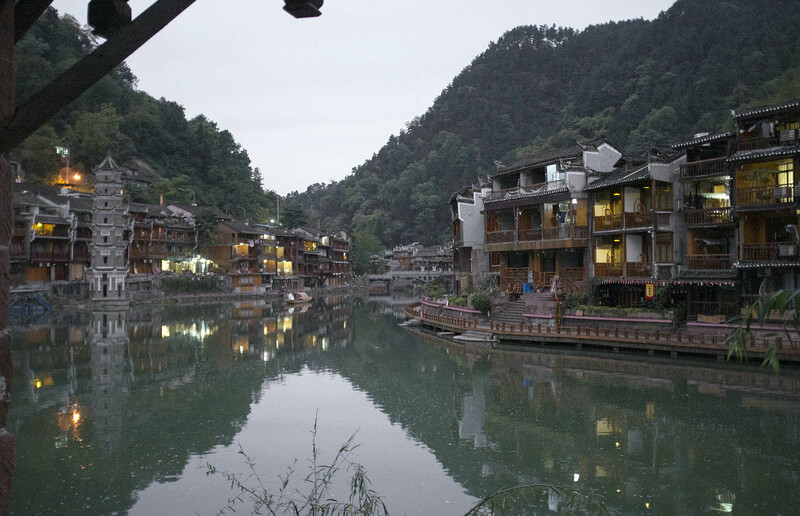 The journey to Fenghuang was long, travelling through mountains and fields, day and night, sun and rain. The bus trip there was the first time I witnessed the most crafty sales technique in history. In China on long-distance coaches, guides not only check tickets and manage safety. In addition to their regular duties they entertain passengers, telling them about their lives, where they are from and are happy working as the bus conductor. After the stories they then turn into sellers, offering passengers the opportunity buy packs of beef jerky. Nevertheless, I finally got there, and felt no regrets, because this place is stunning. Thanks to its remote location the city was isolated from wars and revolutions, and as a result has remained well preserved. Its ancient shape has helped to sustain its unique ethnic languages, arts, folklore and, most importantly, its architecture. The balconies of the old houses rest on pillars, which with time become uneven, causing the balcony to sink down. 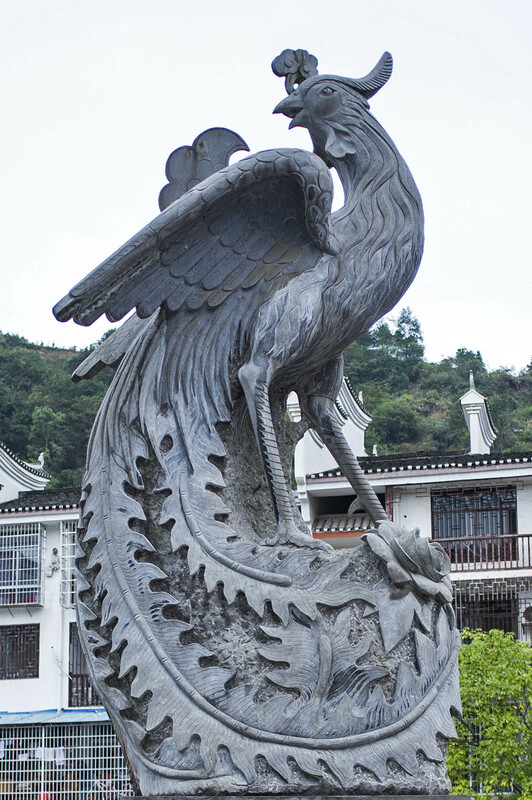 The city is named in honour of the mystical phoenix, believed to be comprised of the body of a duck, the tail of a peacock, the legs of a crane, the head of a golden pheasant, the mouth of a parrot and the wings of a swallow, and to live far away in the mountains of Eastern China. The phoenix is analogous to the West’s mystical unicorn. 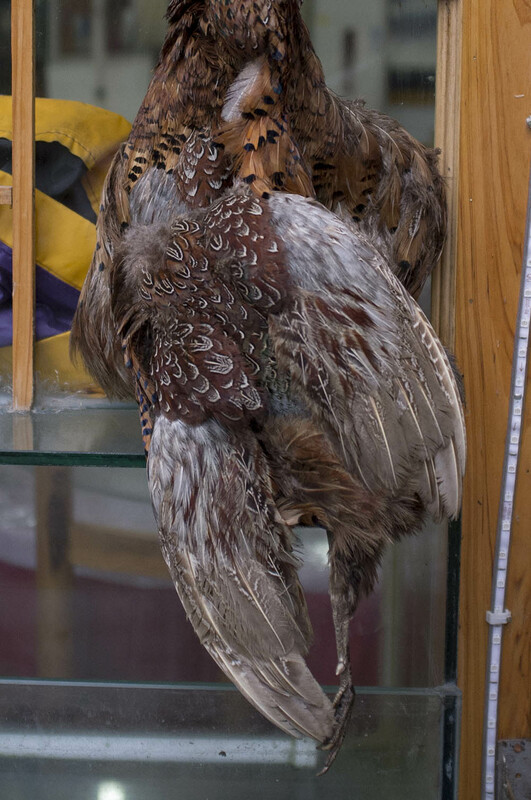 Similarly to the unicorn, the appearance of the mysterious bird has always been rare and it hasn’t been observed for centuries. Legend has it that the Phoenix will appear only when China once again finds peace. The statue of the Phoenix in the city centre on the left and a dead pheasant hangs on the right. As in the legend, the city is a wonder, set against a background of fog, wrapped around the densely forested mountains. 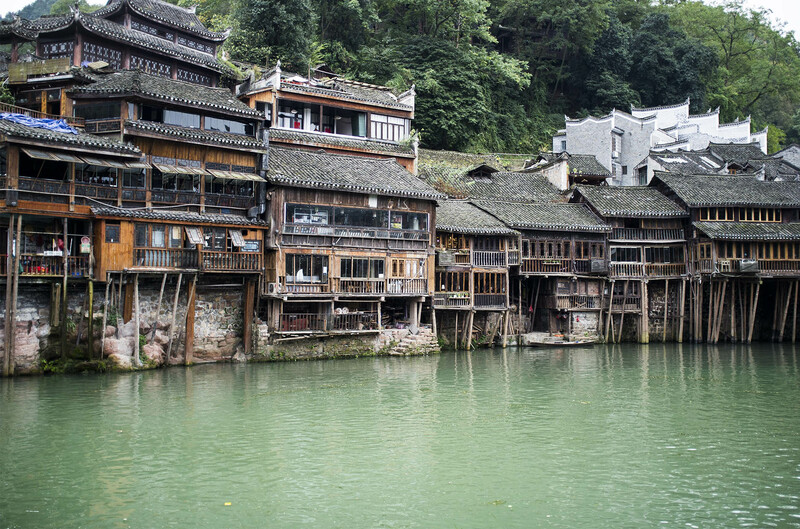 The picturesque river that runs through Fenghuang sparkles with the reflections of the sky and mountains, while old houses on wooden stilts line the banks of the river. Being here is like being in a traditional Chinese painting. 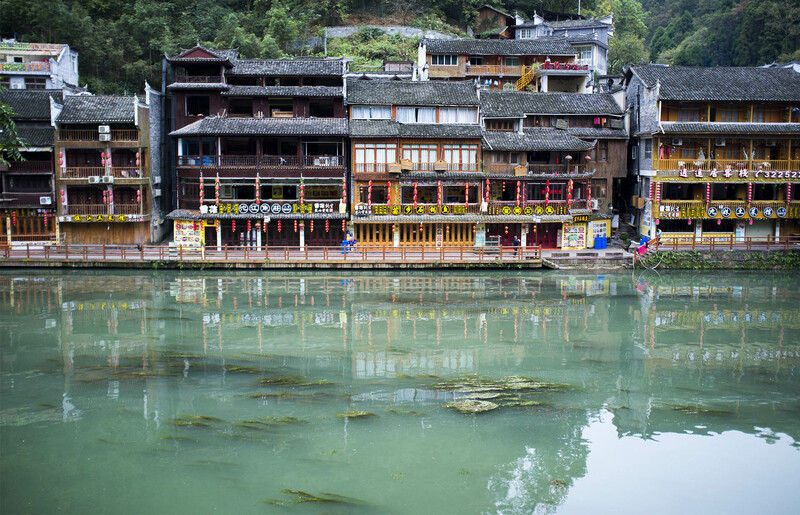 For artists and photographers, Fenghuang is paradise. Early in the morning, before people wake up and come to the centre of the ancient city, a man cleans slime off the sleepers, like a dentist cleaning teeth. Here everyday life is lived at the foot of the river, where men sit patiently with their fishing poles, hoping to catch fish, while the women wash clothes, smacking them with a paddle-like stick. 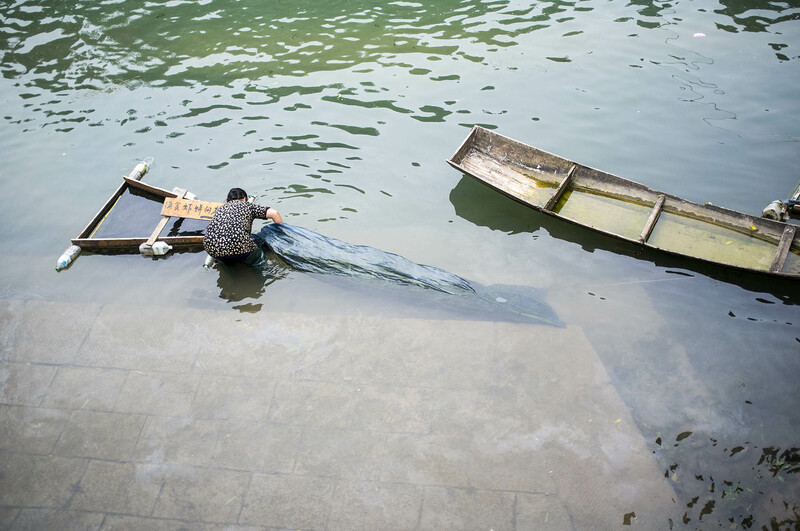 A woman takes a plastic bag filled with vegetation out of the water. 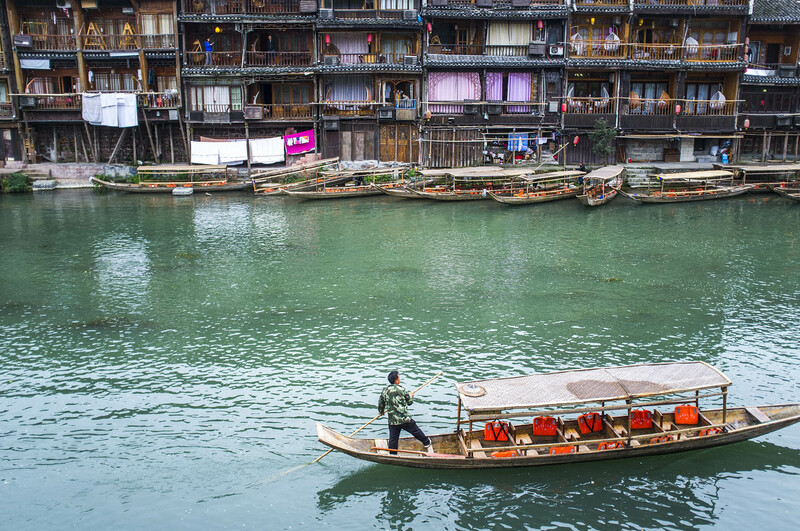 If anyone claims that the city is mysterious and untouched by tourists, this is a blatant lie, Fenghuang, as with any other site in China, is full of tourists. Especially since its inclusion in a provisional list from UNESCO, following which the city was visited by 5 million visitors in the first half of the year. UNESCO noted that the city should be protected due to the painstaking work involved in its planning and construction and its historical significance. After all, the city was built at a river, surrounded by mountains, creating harmony in the relationship between man and nature. I wonder if UNESCO will manage to continue preserving this harmony once the crowds of millions rush to visit the city in the coming years. 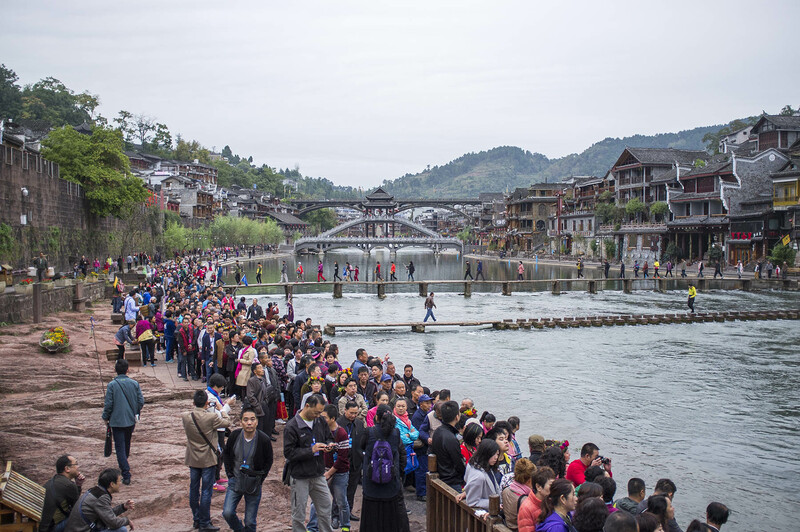 Busses fully loaded with Chinese tourists come to Fenghuang, usually just for a day, before travelling on to the famous park, Zhangjiajie. 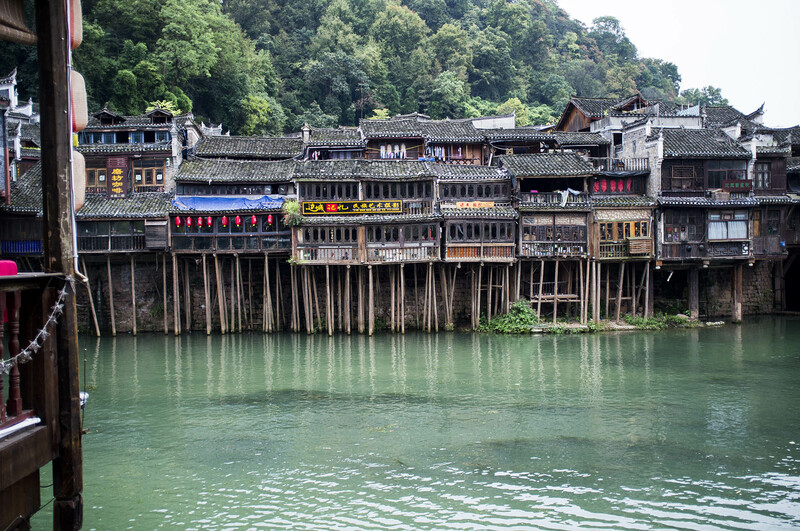 The main tourist activity here is boating down the river and dressing up in the clothes of the Miao minority. Local boatmen earn a living by ferrying tourists up and down the river from the early morning onwards. The most important thing is to avoid the crowds; instead of taking the main road I walked along the shore of the cobbled river street, turning into the narrow alleys where fancy decorations hang. 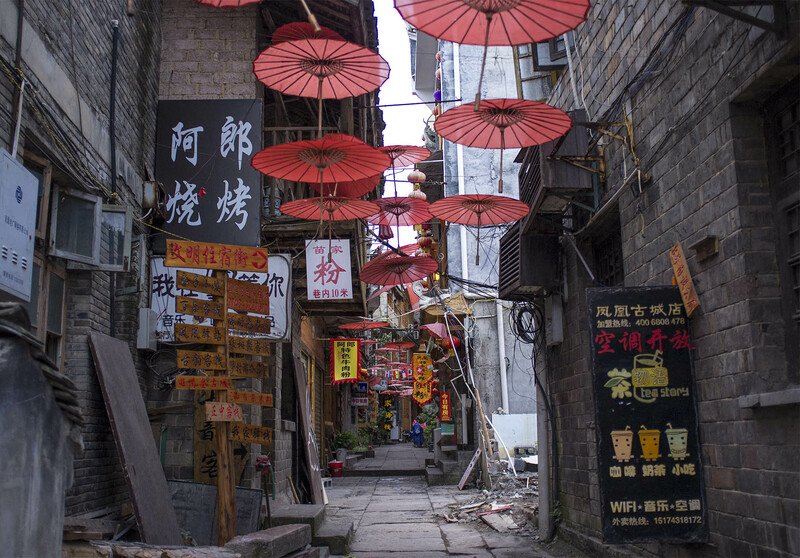 For lovers of all sorts of trinkets and souvenirs, the streets have a great abundance of handmade jewellery, musical instruments, and silks made by the local ethnic minorities. You could also try the local wine, ginger candies and other strange things. 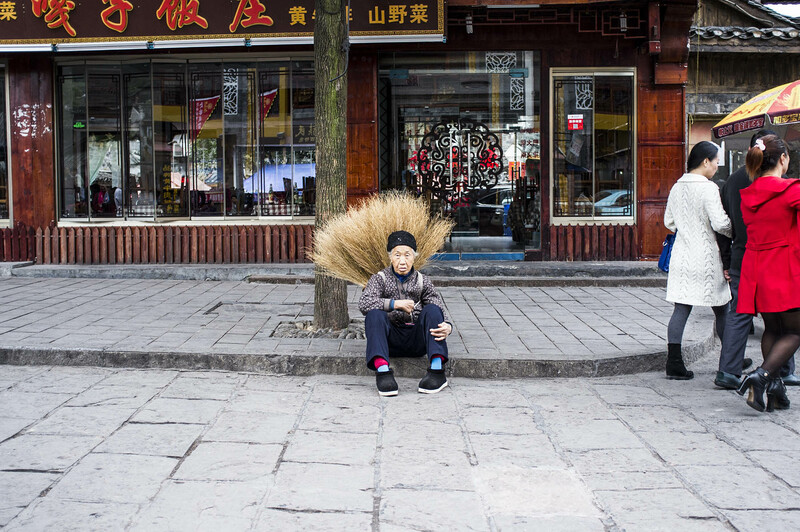 A street sweeper with a basket full of brooms rests on the curb. The ancient part of the city is surrounded by the new part, where there are numerous travel agencies offering tours and excursions around the city and to other destinations. This part of the town is full of locals, busy doing their daily routine, and where you often observe people with baskets. 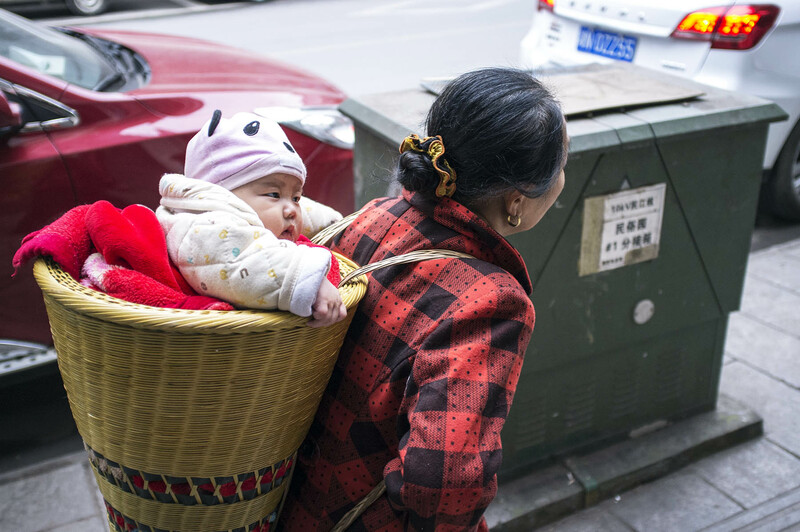 The Chinese frequently use baskets which are similar to backpacks, and in which they carry groceries, bricks and even babies. Grandma is carrying her grandson. From the story of Cook’s voyages. During a voyage in the waters of the Antarctic, Captain Cook refused to continue the search for the land and the ship headed north. Cook was very sick and unable to get up from bed. He suffered from severe pain, and at one time the crew thought that the captain would die. Sick people that didn’t recover for a long time sometimes had fantasies, one of which was for fresh meat. There was no meat on board and in other situations, the captain would have eaten something, dull and tasteless as usual, but this time he craved some dog meat. A poor animal was eventually killed and cooked in a broth, which the captain gladly ate. He then quickly recovered. The Chinese eat dogs, the Maori eat dogs, the Koreans eat dogs. 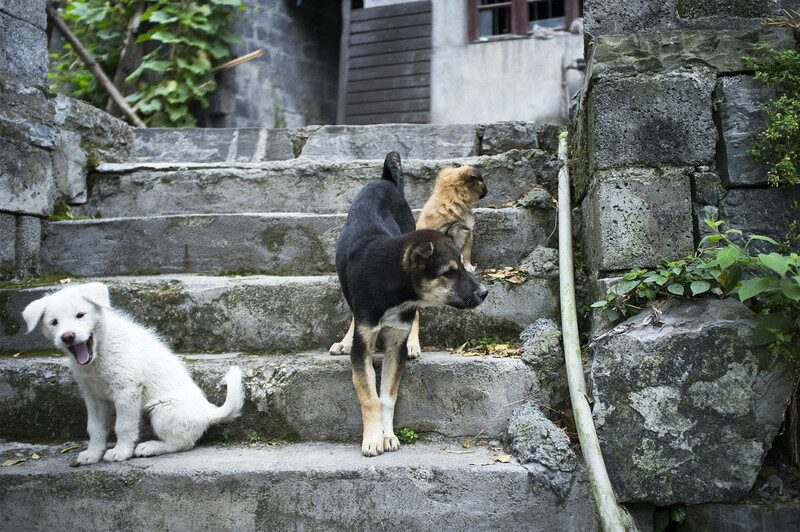 Visayans, Polynesians, Mexicans, they even eat dog meat in some areas of Switzerland. They eat dog and do not get sick. Puppies playing in the yard. The ancient part of the city isn’t big and has little accommodation to offer, so new housing is being built around it and is being styled so it looks like the ancient housing. There are almost no Western tourists so English is hardly spoken, even in hostels. 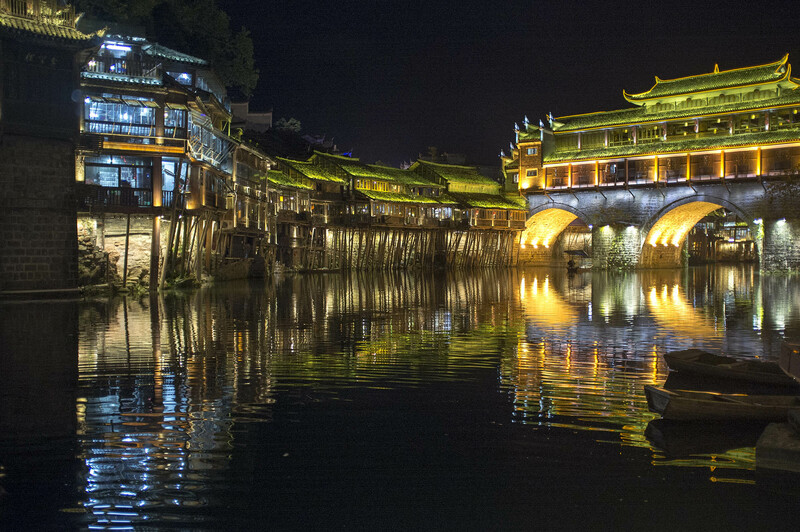 At night Fenghuang lights up; the combination of old wood and stone, illuminated with neon lights seems quite magical. 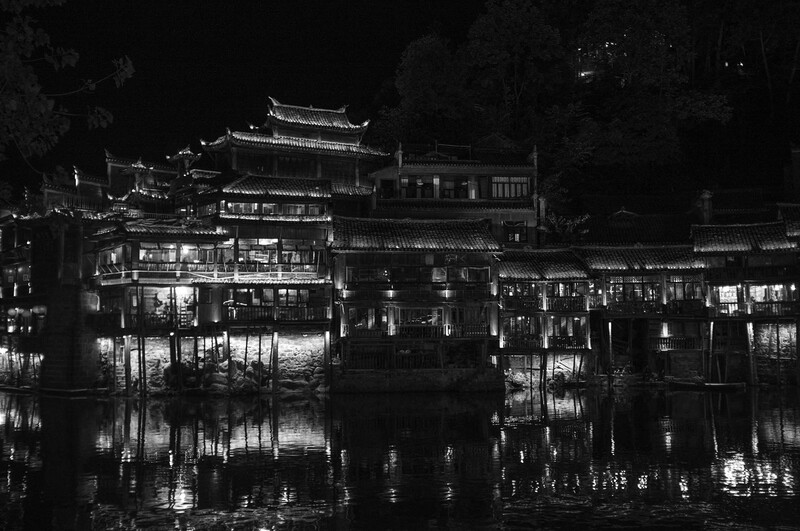 However, the lights and loud electronic music that comes out of the restaurants on the riverside is unpleasant and an invasion of modernity in such a beautiful ancient city. Not surprising since the city has quickly become a centre of commerce. Like everywhere else in China, there are restaurants where the customer takes a bowl and chooses his own ingredients, which are then cooked for him with noodles. 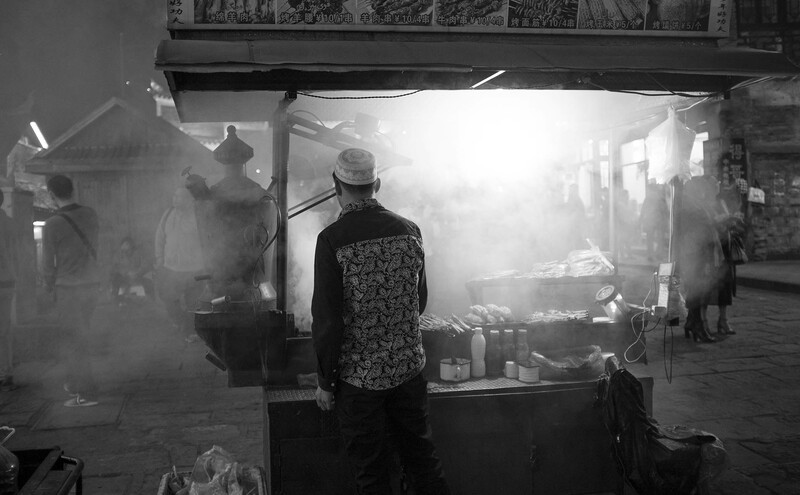 An Uyghur is grilling meat. The city isn’t big and I saw everything there was to see during the day and moved on. Although the city welcomes you to kick off your shoes, relax and do absolutely nothing. Black and white riverside of Phenix City.